Fun is a very relative word, and when we think of our bathrooms, it's rarely the first one that comes to mind. Showering, brushing teeth, primping, prepping and everything else that comprises daily bathroom duty often feels too utilitarian to be called fun. Looking for a few bathroom items that can change that up? Consider these! Do you sing in the shower? Could you use a little musical accompaniment? Whether it's Brahms, Beck or The Beatles, a few tunes while you wash are always a fantastic idea, and a waterproof radio, mp3 player or CD player is a must-have. Sometimes a little decor makeover is just what your bathroom needs - so why not start with a fixture that's bound to give you superior storage capabilities, too? 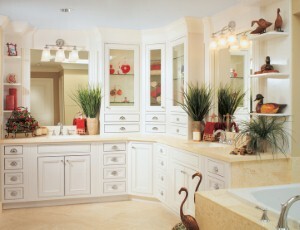 Functional and stylish, installing new vanity cabinets is a great way to ramp up your bathroom's fun quotient. There are plenty of fun paint colors out there, but rarely do you stumble upon anything so brilliant as a truly unique wallpaper design. With the internet at your disposal, go wallpaper shopping and find the ideal funky design for your space.